The annual rate of new home sales dropped 13.4% to an annual rate of 394,000 in July. All four census regions experienced a decline ranging from 5.7% in the Northeast to 16.1 % in the West. The July rate takes annual sales levels back to the late 2012 levels and below the 448,000 first half of 2013 average. The decline is the result of the jump in mortgage interest rates that began in May and accelerated in late June. New homes sales are recorded when the home buyer signs a contract to purchase so the July signings will not close their purchase for several months. The rise in mortgage rates first caused some acceleration in contract signing as June sales as which were 3.6% above May even as mortgage rates rose about 50 basis points. Further increases caused buyers to pause in July to determine if those new heights were permanent. The NAHB/Wells Fargo Housing Market Index continues to show improving builder sentiment suggesting the new home sales dip is temporary as consumers adjust to permanently higher interest rates. Affordability could have some impact as some buyers are no longer able to qualify at the higher rates but rising prices have not diminished demand up to this point. The rise in prices alone has increased monthly mortgage payment 8 % in one year about the same as a 70 basis point increase in rates. 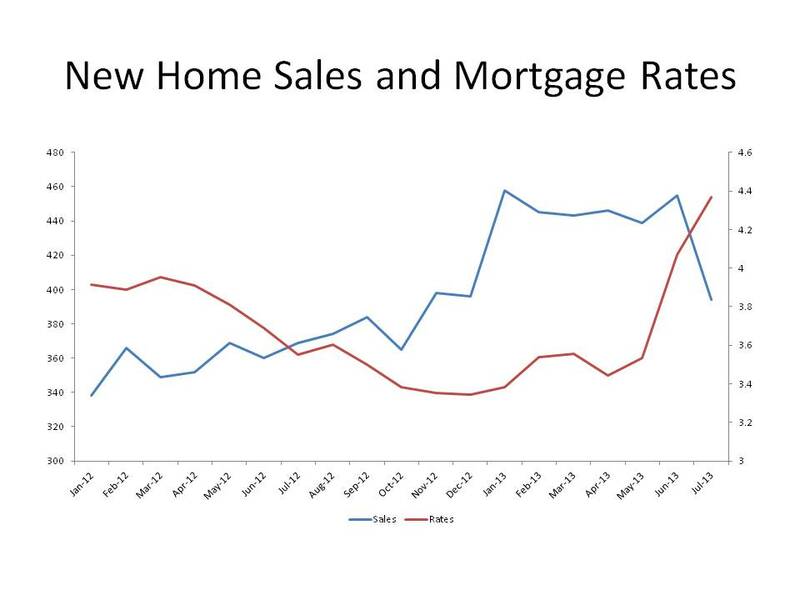 NAHB’s forecast for new home sales remains at 470,000 for 2013 or 28% increase over 2012 levels. Pent up demand, an improving economy, continued advancement in home prices and low mortgage rates by historic standards will support this level. This entry was posted on Friday, August 23rd, 2013 at 1:29 pm and is filed under Uncategorized. You can follow any responses to this entry through the RSS 2.0 feed. You can leave a response, or trackback from your own site.